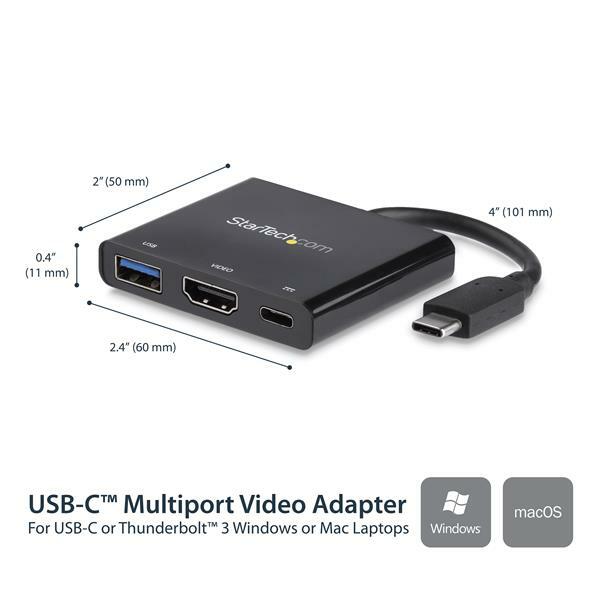 This USB-C™ multiport adapter with HDMI lets you add vital connections to your MacBook or Windows laptop, through a single USB-C port. 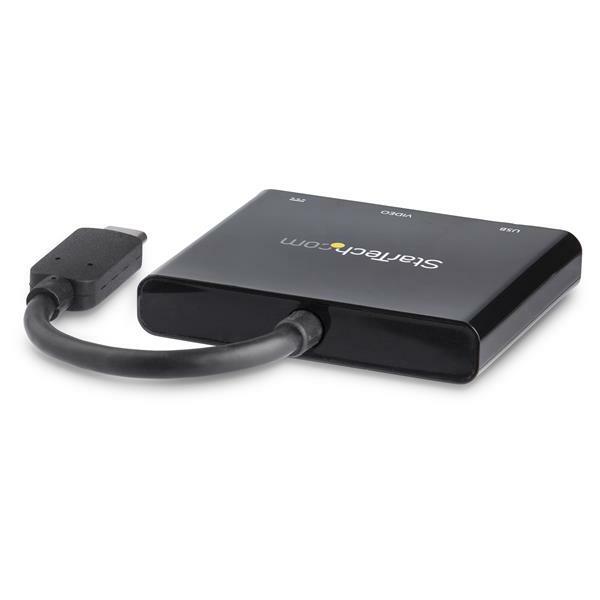 For maximum productivity, connect your USB-C or Thunderbolt 3 laptop to a 4K 30Hz monitor, using this USB-C to 4K HDMI adapter. You can also connect to an HDMI projector or TV in a boardroom or other meeting space, to deliver presentations on a shared screen. The USB-C adapter lets you power and charge your USB-C laptop during a presentation or while you’re working, with a USB-C Power Delivery port. Even if your laptop has only a single USB-C port available, you can keep your laptop powered. This USB-C multiport adapter offers a USB 3.0 port that's backward compatible with older USB devices - ideal for data transfers, syncing, or charging your mobile devices. The compact all-in-one adapter is a vital accessory for your USB-C laptop. With its small-footprint design, you can take it with you anywhere you would use your laptop. CDP2HDUACP is backed by a StarTech.com 3-year warranty and free lifetime technical support. 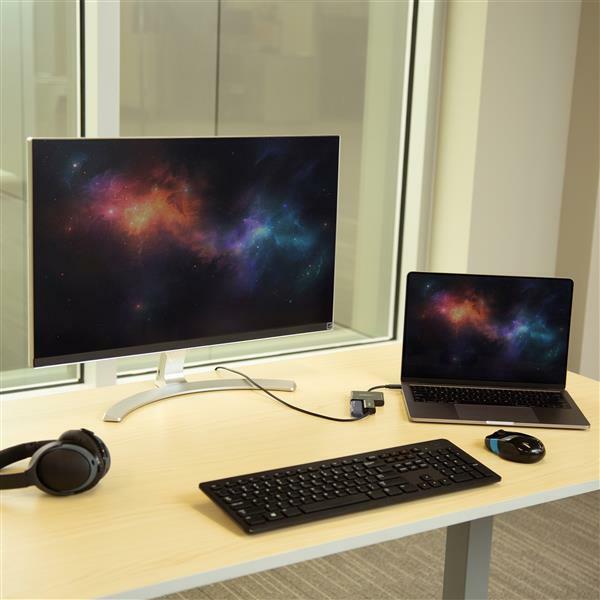 System and Cable Requirements A host laptop with an available USB-C port (to ensure full adapter functionality, the host USB-C port must support USB Power Delivery 2.0 and DP alt mode). Optional: USB-C power adapter (for example, your laptop’s USB-C based power adapter). I have been testing this adaptor with several Lenovo laptops and my Galaxy S8 phone using different monitors, 4k TVs and projectors. Everything I have been connecting has worked but sometimes I have needed to re-connect the HDMI cable to get video working. The adaptor comes in a box about the size of a couple DVD cases. I think the box was the worst part of this product as the adaptor just bounces around in it. I even tried to put it back in the box and after a quick shake it was bouncing around again. The adaptor itself is smaller than the palm of my hand the cable just longer than a finger. The adaptor is made of nice shiny plastic while the cable is soft rubber. The adaptor connects and starts working immediately without any installation. I have been able to watch videos on a USB stick connected to the adaptor while outputting 4k video and charging all at the same time. The only issue I have had is when connecting things to the adaptor, sometimes the HDMI stops working. To fix it I have to unplug and re-plug the HDMI cable to this adaptor to get audio/video working again. This adaptor works really well and does all the essentials in a pinch. It is like a pocket size docking station. I am going to make this my go to cable for meetings and traveling from now on as it has everything I could need. I received this product in exchange for an unbiased review. (4 stars) Great device in a tiny package! This adapter is small, light and easy to use. The cable could stand to be a little longer but that may depend on your personal usage and placement. Pass-through power like this device has should be standard on all USB-C dongles. Gaining additional ports without losing any is always a win in my book. Disclaimer: I received this product in exchange for an unbiased review. The display gets recognized but nothing shows. It takes multiple attempts to disconnect and reconnect to get it to work. It's really frustrating when you're at work and just need your display to turn on when you plug your monitor in. I would not recommend this product. Thanks for sharing your feedback on our CDP2HDUACP. We apologize that it isn't working in your configuration and we'd like to help. We have Technical Support Advisors available 24 hours, 5 days a week. Please chat with us at https://chat.startech.com or give us a call so can troubleshoot this issue for you. 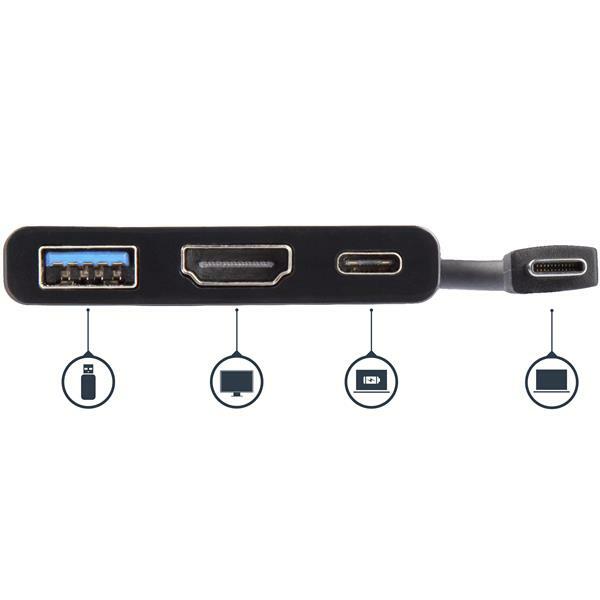 (5 stars) Turns USB-C into usb and HDMI! 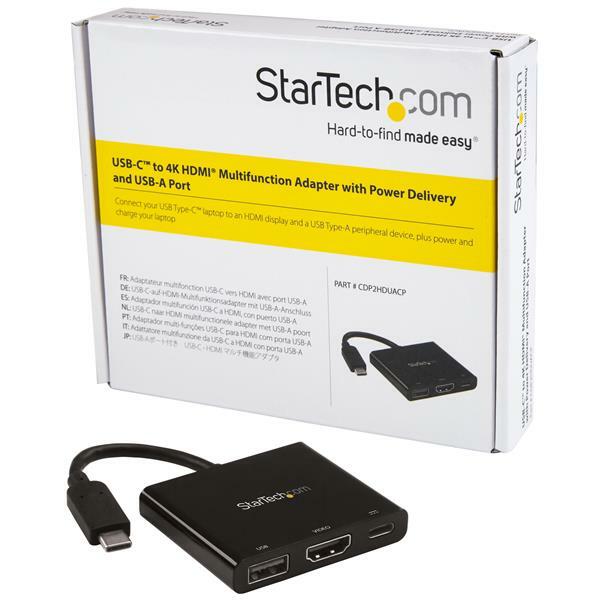 The StarTech.com USB-C to 4K HDMI Multifunction Adapter with Power Delivery and USB-A Port is great for laptops without the HDMI port and the usb-A port is a bonus! 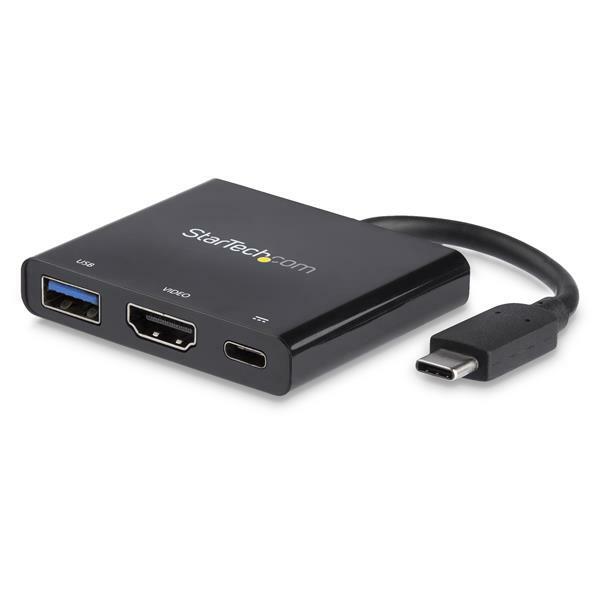 If you are at home or in the office and you would like to project your laptop to a tv that has HDMI only this adapter is what you need! Light weight and easy to use by just plugging the adapter into the USB-C port in portable device (laptop, tablet, etc. where device supports external display) and then the HDMI cable from tv into adapter -> instant screen sharing! In the box is the hub. 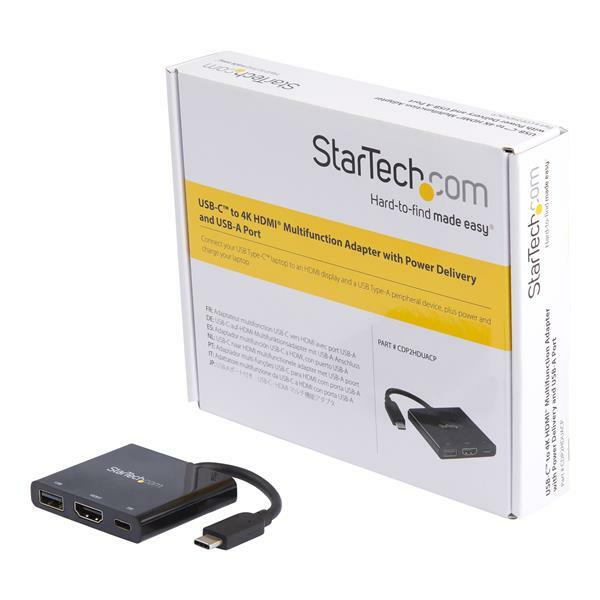 Another great product from Startech.com! I received this product in exchange for an unbiased review. The multifunction adapter is handy if you have a USB-C power connection. The short cable may leave the adapter dangling depending on the device's port location (i.e. tablets).